What makes Durham a great place to live and work? 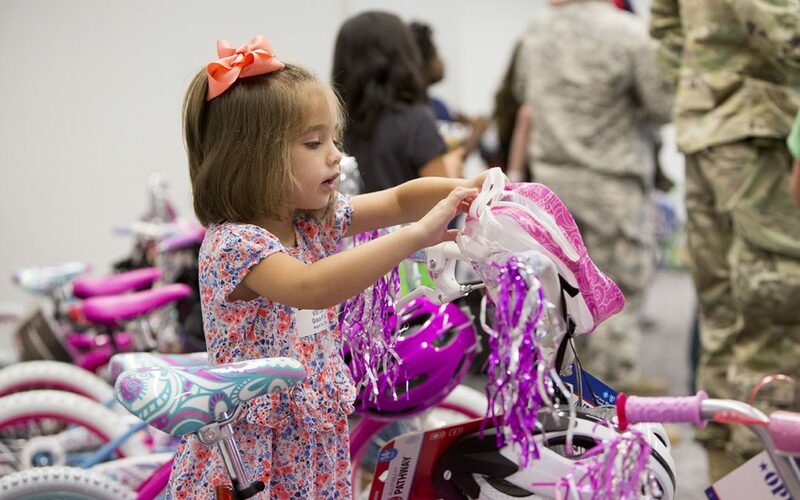 You could name a lot of things, but the most important is that Durham is a community that cares. Durhamites look out for one another and the city boasts a network of churches and nonprofits that extend a hand – or food or clothing or shelter – to those in need. Blue Cross and Blue Shield of North Carolina recently relocated its headquarters to Durham, and we wanted to repay some of the hospitality that Durham has shown us. After all, that’s the neighborly thing to do. 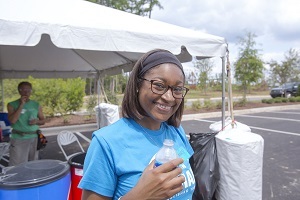 So we fanned out into the community on Wednesday, August 24, for our Day of Service, working alongside those who make Durham a great place to live. 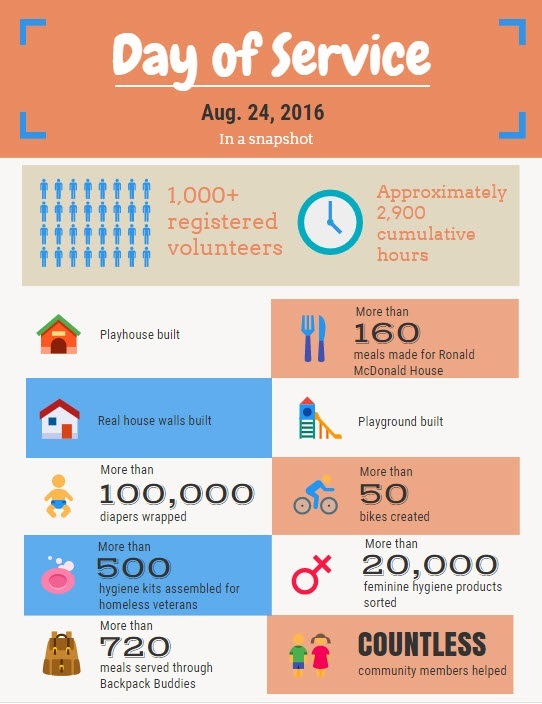 The folks who work and volunteer for nonprofits show us that every day is a day of service. Over the course of the day, we met many of our neighbors. We got to see firsthand the essential work being done by faith groups and charitable organizations whose only purpose is to make life better for the people they serve. And we witnessed the dignity and bright cheer of the families and children in some of our most vulnerable neighborhoods. We applaud the caring people who make North Carolina the welcoming place that it is. We’re proud to call Durham our home, and we hope you’re inspired by these stories of caring people and communities. And how are the kids faring? The oldest is fourteen and he’s enrolled in an early college program. He’s interested in computer programming, but he’s also drawn to follow in his dad’s military footsteps. The youngest two are happy to have their father home right now, snuggling into him a few times during our chat. 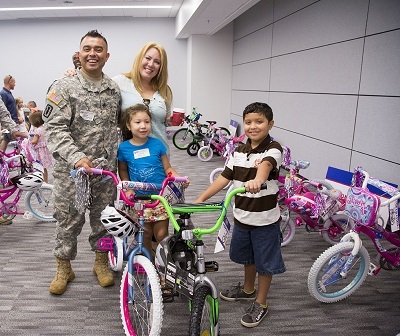 The kids – along with 19 others – received bikes donated by USO and assembled by volunteers on the Day of Service. In a nation often divided into red and blue, it’s easy to forget that great things are possible when the two colors come together. 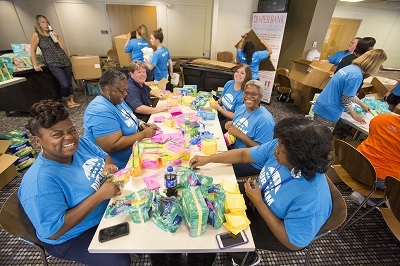 More than two dozen Blue Cross volunteers packed 500 hygiene kits for homeless veterans and patients at the Durham VA Medical Center. The personal items will be distributed through the Durham VA, the Durham Rescue Mission and Urban Ministries of Durham. The kits, created as part of the Red Cross Totes of Hope program, contain items such as soap, deodorant, shampoo and a rain poncho. 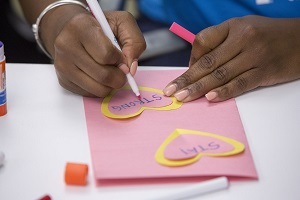 Recipients need those items and value them, but most prized of all are the personal notes volunteers place in the bags. During the course of one day, 50 volunteers framed the four exterior walls for a house that will eventually stand at 1208 Alma Street in Durham, about 15 minutes down the road from the Blue Cross campus where the walls were built. Habitat for Humanity buys land, builds houses, and loans out the mortgage with zero percent interest to qualified home buyers. “The mortgages, paid by the homeowners, are usually between $550 and $650 per month,” said Blake Strayhorn, executive director for Habitat for Humanity of Durham. “We work with hardworking families to provide them with a safe and affordable place to live.” As part of the deal, homeowners put in at least 250 hours of sweat equity, helping to build their own and other Habitat houses. His name is Willie Patterson, but nobody calls him Willie. He’s Mr. Patterson. It’s a show of respect for the man who literally saved Durham’s Crest Street neighborhood from being erased in the name of progress. Blue Cross’ Day of Service included the company’s ninth KaBOOM! playground build in North Carolina, this time on Crest Street in Durham. The construction project drew more than 200 volunteers, many of them from the Crest Street area. Additional volunteers came from Durham’s Parks and Recreation Department, Keep Durham Beautiful and the Durham Police Department. The new play space will serve as a focal point for the community, a place where friends and neighbors can strengthen the unity that spared their homes from the wrecking ball. A former social worker and mom of three, Michelle Old started the Diaper Bank of North Carolina from her kitchen counter back in the spring of 2013. Her mission that first year was to cover 50,000 babies’ bottoms. Three years later, the NC Diaper Bank has distributed nearly a million diapers in 2016 alone. Communications specialists Charlene Macielag and Maggie Brown and internal communications manager Mark Stinneford contributed to this post.